Oven to 220C, and put the popover pan into the oven to get rocket hot. Take out all the other racks other than the lowest one for this unless you want to bake the rack into the top of the popover. 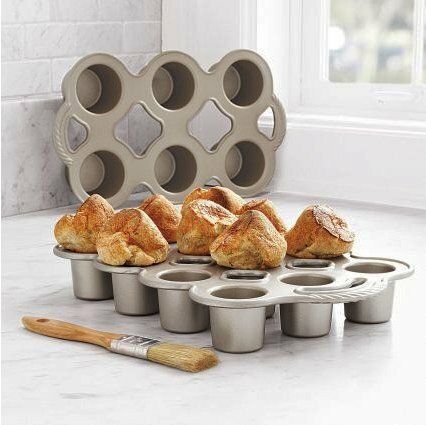 If you don’t have a popover pan, get one – muffin tins aren’t the same thing (TK Maxx have them, so does Amazon, hell, you can even order them direct from the manufacturer if you have to). Dump everything unceremoniously into the blender, blitz for 30 seconds, scrape down sides with spatula, blitz for 30 more seconds and leave stand for a minute or two. You can let the batter stand longer – some say you have to, but I don’t think it’s that important; the 1:1:1 eggs:flour:milk ratio and the heat are far more important. While the batter is standing, pour either a teaspoon of beef drippings from the roast (you are doing this for Sunday lunch, aren’t you?) or melted butter into each mould (it should hiss and spit or the tin’s not hot enough yet) and brush it up the sides of the mould (and don’t forget the centimetre or so around the lip of each mould). Pour batter into popover pan moulds (half-fill each one only – you really don’t need or want more than that) and bake at 220C for 30-40 minutes (or however long it takes to get to golden brown). Take out from oven, and as soon as you can – and preferably immediately, you do not want them to cool down until you’ve done this – stick a knife in the top of each one (in any handy crevice in the top of the popover) and twist slightly to create a vent for steam; leave stand for five minutes, then depan and let cool on a rack. Serve warm. 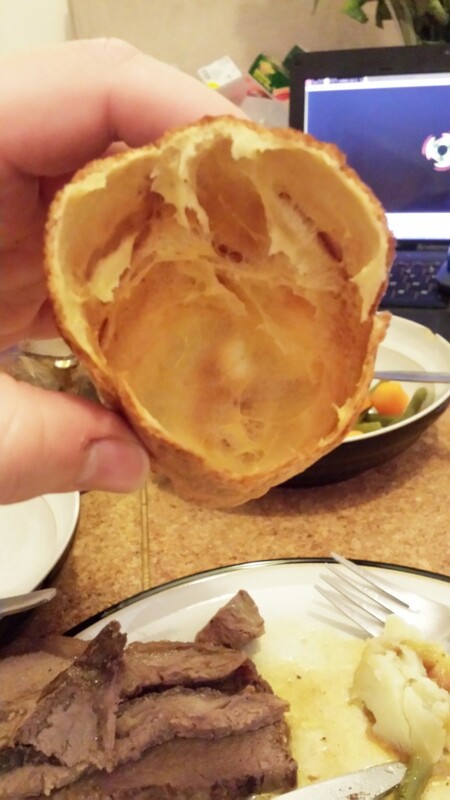 *It’s a yorkshire pudding if you use beef dripping and it goes in one huge pan and you cut it up to serve; it’s a popover if you use butter and they’re single-serving things made in a popover tin (think muffin tin but bigger, straighter and heavier); a yorkshire popoover is when I use the same recipe for both cases and can’t be bothered to call the same thing different names….